Our range of bottleless high usage coolers offers high turnover of water and allows to get chilled, clean and filtered water from a mains water supply. Our engineers will come and install the coolers and 6 monthly sanitisation are available for £75. For your £75 you get a visit from one of our engineers who will fit a new filter, sanitise your cooler and clean everything up leaving you with a perfect clean and healthy cooler. Home Water coolers is a sister company of The Water Delivery Company and The Water Cooler Company, all rental contracts for bottleless coolers taken out will be with The Water Cooler Company. 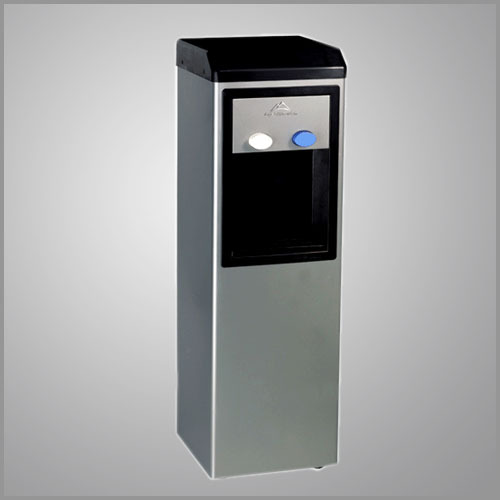 The Cascade is a mains-fed water cooler to meet the needs of high usage customers and to withstand robust use. The Cascade’s state-of-art design offers two water temperatures, cold and cool. Durably constructed for high volume rental applications, with high chilling capacity in a pressure reservoir. The Cascade also features hygienic solutions such as concealed faucets,a sanitisation fluid entry point. Ideal for installation in public institutions, schools, government offices, colleges, etc. This plumbed-in water cooler can be rented from £7.00 per week. Mains-fed water supply. The cascade also has a fully integrated waste water system. Cold water – Up to 18 litres of chilled water per hour. Please note the prices above do not include VAT which is added when you pay but do include next working day courier delivery. Installation Service – If you would prefer us to arrange for installation anywhere in the UK please call us and we can arrange from £95 ex VAT. Click here for full details.